I LOVED working with Ashlie! She was such an sweet, easy-going and wonderful client and I’m so lucky she chose me as her preferred stationer. We started off with her save the dates. At this stage, she chose a gatefold save-the-date where we could have a photo of the couple. The part that had not been decided was what graphic were we going to use throughout her wedding stationery. She had a passion for bonsai trees and was using them for her centerpieces so I kept that in mind as an option. Another option was the venue itself which was Castle Ladyhawke. At the entrance of the castle, there were 2 lanterns which ivy crawling on the walls. So initially we created samples with these two options. 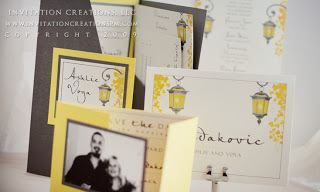 Ultimately, She chose the lantern style:) Ashlie had a preference for a classic look with modern tendencies. Her colors were yellow and gray. 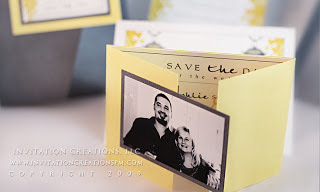 So we decided to use a predominant yellow color for her save the dates and reverse it for the invitations. She loved the pocket fold look and wanted this for her invitation. 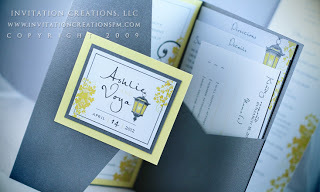 We created 4×9 sized programs that are straight and to the point but coordinate with the rest of her wedding stationery. I do wish Ashlie and Voya only the best and look forward to the next time our paths cross again.